The EU General Data Protection Regulation (GDPR) deadline was 25 May, 2018. If you think you’re immune from its impact, think again. In a Ponemon study, 65% of businesses are concerned about potential fines and 74% say complying with the GDPR will negatively impact their organisation. Whether you’ve prepared or not, attend this webinar to find out best practices, pitfalls, and how companies like yours can achieve some quick wins in their long-term compliance strategy. Find out how the Citrix Security approach brings together the entire Citrix portfolio to address internal and external threats by providing holistic visibility and proactive protection of your company assets. This on-demand webinar deep dives into: protection of applications from on-premise to the cloud, hypervisor protection of servers before the threat hits the operating system, and device and user protection from external threats. Proactively counter internal and external threats through analytics. IT transformation, cloud, and new application development methods are changing the face of application delivery infrastructure. These new infrastructures require flexibility, security, and operational efficiency to uncover the true value to the business. We will discuss the changes driving infrastructure architects to evaluate the application delivery networking and provide a clear strategy on successfully migrating your business to a modern app delivery for hybrid multi-cloud and Cloud Native environments. 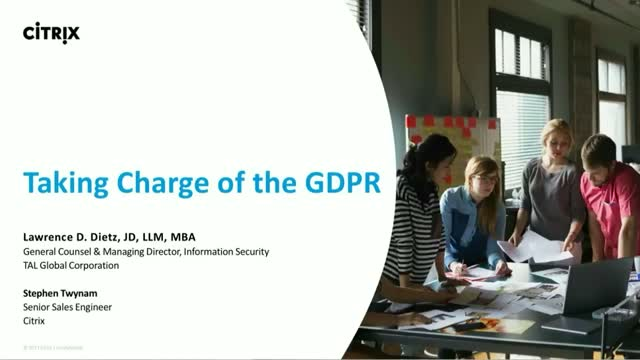 In May 2018, the General Data Protection Regulation (GDPR) takes effect. Are you ready? In a recent Ponemon study, 67% of respondents were aware of the GDPR, but only 50% of the organisations had allocated budget and started to prepare for these new regulations. GDPR will impose new rules on businesses, government agencies, and other organisations that offer goods and services to people in the European Union. Ransomware, zero day exploits, and phishing attacks, they're among the biggest nightmares facing IT today. The time between exploit, discovery and weaponization is getting shorter and shorter and it’s going to be harder and harder to protect yourself. Last year, 63% of organizations experienced an attempted ransomware attack, with 22% reporting these incidents occurred on a weekly basis. * Attend this webinar and learn four ways you can reduce your exposure to ransomware threats, recover encrypted data more quickly and get employees back to work. Secure your digital business. Safeguard your apps and data.